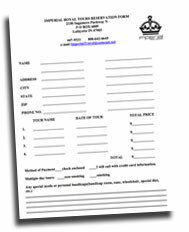 Please fill out the following form. Once complete, click on the "SUBMIT RESERVATION" button at the bottom. If you would like to print and mail your reservation form, please right-click and “save file as” to download a PDF version of our reservation from.